Picnic Area: Fans coming to Bethpage Ballpark as a group have the option to enjoy a 90-minute pre-game picnic in a designated area in left field. 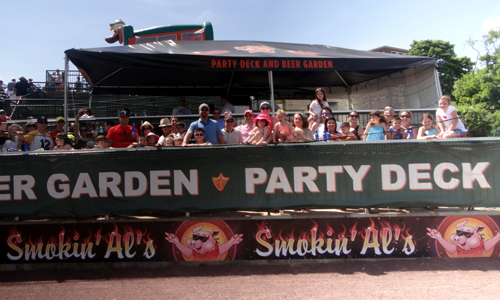 Party Deck: Groups in attendance can watch the game from our Party Deck down the left field line. All special seating sections of Bethpage Ballpark are advertised in brochures, pocket schedules, yearbooks, and the Long Island Ducks Web site. They are also publicized during pre-game PA announcements. The Ducks have various interactive sponsorships for services, games, and areas of Bethpage Ballpark. Customer Service: The customer service booth is a frequently visited area for fans with questions before, during, and after the game. Contest winners and fans that are paged are also directed to Customer Service. This sponsorship includes a PA announcement before every game and signage above the booth. First Aid Center: Fans with medical needs are directed to the first aid center. This sponsorship includes a PA announcement and signage. Suite Level Naming Rights: Have the entire suite level of Bethpage Ballpark named for your company. The suite level includes 20 climate-controlled luxury suites, as well as the "Duck Club," which offers waiter and waitress service during the game. Naming rights for the suite level include promotion in ticket guides, park guides, and directional signage. Package also includes a sign on balcony in front of the suite level. Fast Pitch Game: An extremely popular game where kids get the opportunity to see how fast they can throw a baseball, and get a prize if they hit a target in the giant Fast-pitch inflatable. Sponsorship includes PA announcements throughout the game and a banner on the side of the fast pitch-blow up. Autograph Booth: Before home games, fans can get autographs from Ducks players at the autograph booth located on the concourse of Bethpage Ballpark. Sponsorship of the booth includes a pre-game PA announcement and color signage on the booth itself. 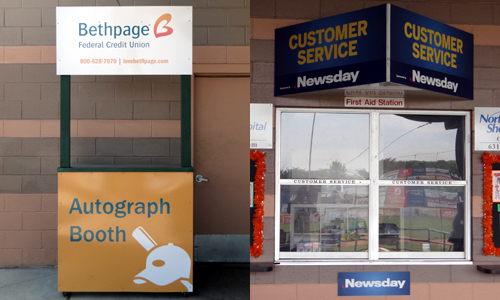 Yearbook Booths: Located at the East and West entrance gates of Bethpage Ballpark the booths are a popular attraction for fans looking to purchase yearbooks and scorecards at the ballpark. Sponsorship includes color signage on the booths and a PA announcement before each game. The Ducks have various items visible on the field available for sponsorship. Bat Boys: An essential part to the operation of the game, the batboys have a company logo on the back of their jerseys. Batboys make several appearances on the field during a game in front of large crowds. Batboy sponsorship also includes a pre-game PA announcement. QuackerJack: QuackerJack is the Long Island Ducks' loveable mascot. 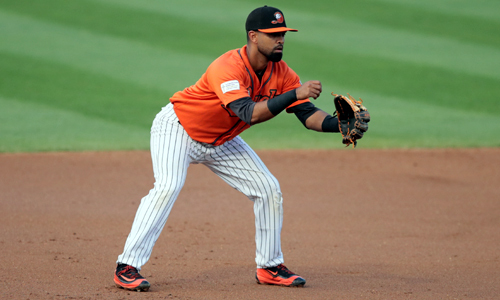 "QJ," as he is affectionately called, appears on the field before and during the game, is involved in promotions, and walks around the stands of Bethpage Ballpark entertaining fans of all ages. Sponsorship of QuackerJack includes a patch of your company logo on his jersey and a pre-game PA announcement during pre-game ceremonies. Uniforms: Put your company logo on the uniform of every Ducks' player and all members of the field staff. The logo will be placed as a patch on all uniform sleeves, giving your company exposure at home and at every ballpark throughout the league. 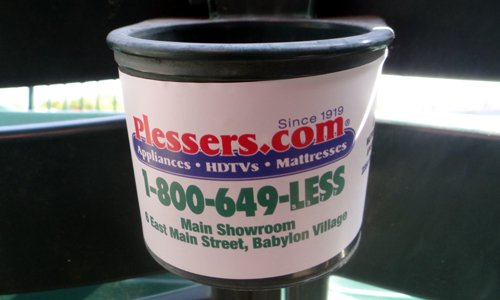 Every fan at Bethpage Ballpark has a cup holder in front of them, and you can have your company logo on it for all to see. A great way to expose your business to over 6,000 people on a nightly basis. 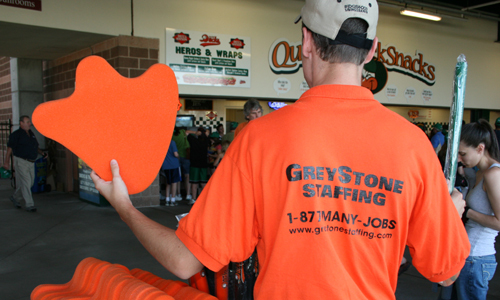 Put your company logo on the back of the highly visible game day staff of the Long Island Ducks. Staff shirts are worn by all ushers, ticket-takers, and miscellaneous staff.